Annamaria Brenti reached out in May 2017 with details of her Finestre Migranti/Immigration Windows Quilt project. Did I want to participate? “Of course!” I immediately responded. As I write, I realize it is twenty years that I’ve known Annamaria. Our paths first crossed in Frascati, Italy when word traveled that a new quilter had moved to town. She was Italian, but began quilting in America. Having lived in several countries and traveled extensively, Annamaria’s curiosity and intensity observed and absorbed traditions from around the world. With this toolbox of skills and love of Italian history, her quilt vision blossomed. A little aside: The oldest extant quilt (trapunto). 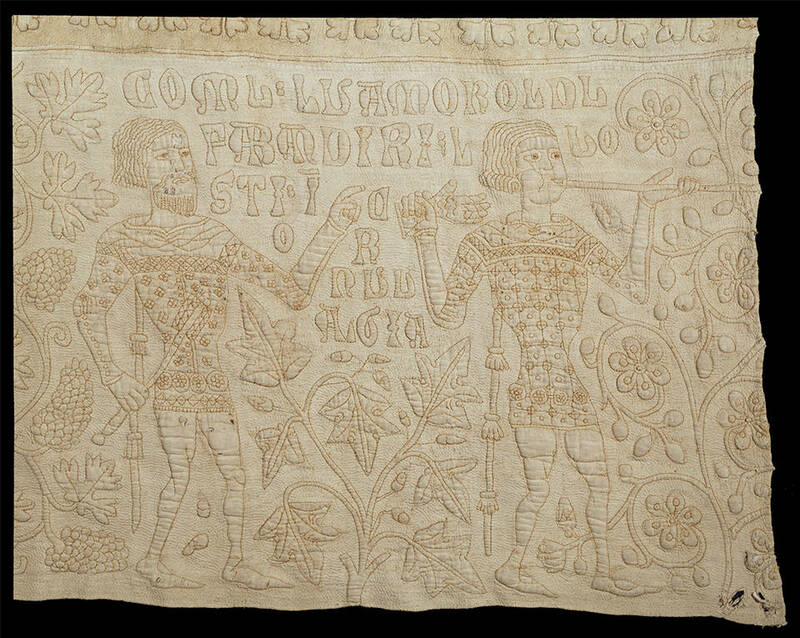 is Italian The magnificent “Tristan Quilt” was made during the 1200s CE in Sicily. Quilts are layers of fabric with wadding that are held together with stitching. Patchwork is the assembly of fabric pieces to create a flat surface. Patchwork quilts are a relatively recent (1800s) needlework tradition with roots in the US and England. The patchwork trend migrated to Europe as it gained popularity in the 1980s. It was the beginning of patchwork’s popularity in the Castelli Romani. When Annamaria moved to Frascati, QuiltItalia, Italy’s national quilting organization, was a tiny bud. Patchwork led me to friendship with Silvana Zenatello di-Manzano, Madalena Lucchetti and Giovanna Mostardi. Days of patchwork, nights of group meals in Monteporzio Catone and exhibits in community arts centers gave my quilting an anchor as I explored techniques and considered my vision. The Finestre Migranti/Immigration Windows Quilt project differs from other group quilt projects Annamaria’s organized. Annamaria wants worldwide perspectives on immigration within a framework. Past group projects implemented an already established pattern that was executed with individual contributions curated by Annamaria. allows each quilter to mix and matches nine different columns configurations. The framework gives complete control to individual interpretation while still linking each piece. Annamaria has been very successful in recruiting quilters from around the globe. The work will debut at the 2019 Verona Tessile. Annamaria, Silvanna and others maintain an active Facebook page where participants share photos of their process. The framework was straightforward. The possibilities were endless. I decided to limit myself to the 150cm width. Annamaria, who thrives on making art in large scale that is filled with mesmerizing details, has declared that her quilt panel will be 177″ wide. I realized that the larger the quilt, the more difficult it would be for me to focus on my theme. My challenge would be to distill a theme and present it clearly within the 63 windows of my quilt? What will my immigration windows quilt say? 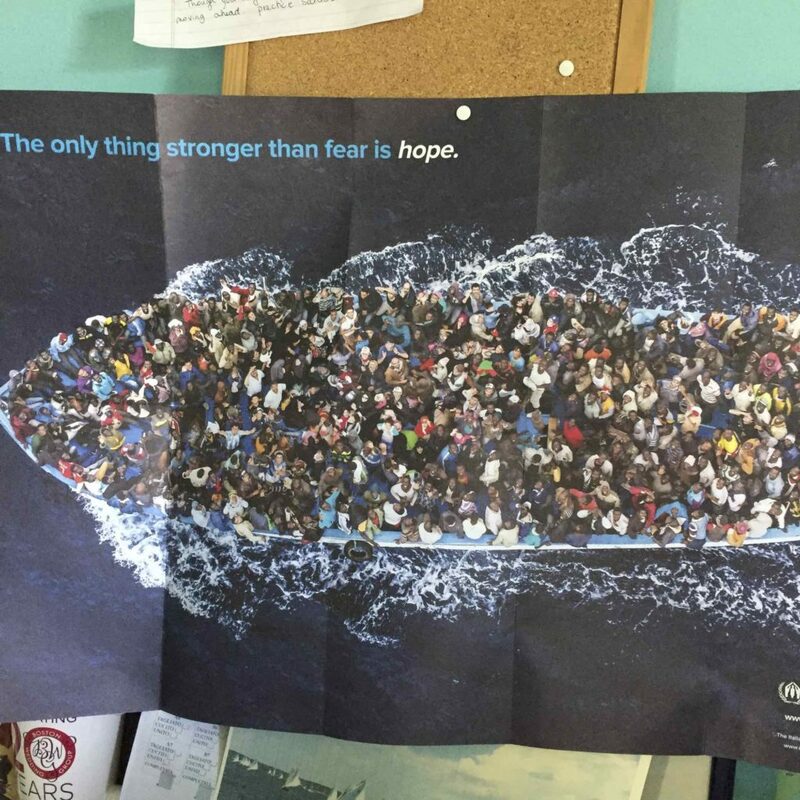 When Annamaria contacted me, a poster from a fundraising appeal from the UNHCR stirred emotions each time I entered the kitchen. “The only thing stronger than fear is hope,” in large white letters topped this photo of an overcrowded boat filled with refugees. Massimo Sestini‘s award winning image resonated throughout the world. The expressions of those passengers off the Libyan coast in 2014 vary. Some are happy, some preoccupied with children, some fearful and other look blankly at the camera. Many look cold and worried. Initially I thought that the Mediterranean travels of refugees would anchor my quilt. Refugees are a world wide phenomenon. The flight and twisting journeys of those forced to flee cover the earth. Between 1997 and 2016, twice as many people live with forced displacement. The UNCHR estimated that more than 65 million people were refugees in 2016. That is a mind boggling number. The majority flew crises in Syria and South Sudan, and half of the refugees are children. Words like hope, movement, work, adaption, journey filled my inspiration list as I searched for my theme. Of course, immigration issues in the United States frame the United States since colonial days. The first immigrants, the Pilgrims, fled religious persecution. Later, indentured servants and slaves came to the US for agricultural work. This tradition continues today. Our agricultural economy relies on immigrant labor; a fact that we may not see but touch every day with the food we eat. Upon learning that nearly half of the US farmworkers are illegal migrant workers, ideas started moving into focus. California industrial farming relied on migrant workers. Dairy farms in Wisconsin and Vermont rely increasingly on migrant workers. Small farms in Massachusetts are worried that immigration enforcement will prevent them from bringing product to market. Unless you grow all of your own food in the US, you rely on migrant workers. Without immigration reform, with a US administration that sees immigration as bad news for America, my quilt theme developed. I’m still assembling my 63 blocks. 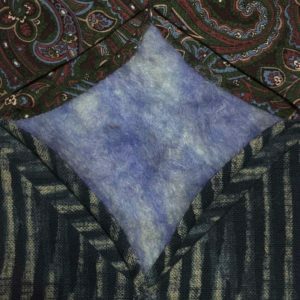 Undoubtedly I will look at the structure and adjust my plan for the felted and stitched pieces I plan to insert into the cathedral windows. Using hand painted and commercial fabrics can sometimes be tricky, but my first finished window looks promising. I haven’t picked the project up since April, but the next couple of weeks will focus on this. Block by block, I hope to have my immigration window quilt done by October. If only we could reform our immigration system to acknowledge and support the people who work so hard to feed the United States by October….